Fruit trees range from citrus--orange, lemon, lime, grapefruit--to stone fruit--nectarine, peach, plum, cherry--and seed fruit--apple, pear. Each type of fruit tree has a different set of standard growing guidelines, including temperature, soil and sunlight. Some fruit trees require protection in the winter, in structures like houses or greenhouses. All fruit trees require full sun all day, with summer temperatures over 60 degrees Fahrenheit. Many fruit trees do best with temperatures between 70 and 80 degrees Fahrenheit and cease to grow or die in lower temperatures. Though stone fruit trees like cherries and peaches are hardy down to 0 to 20 degrees Fahrenheit and require a winter chill, all citrus trees suffer in cold weather. 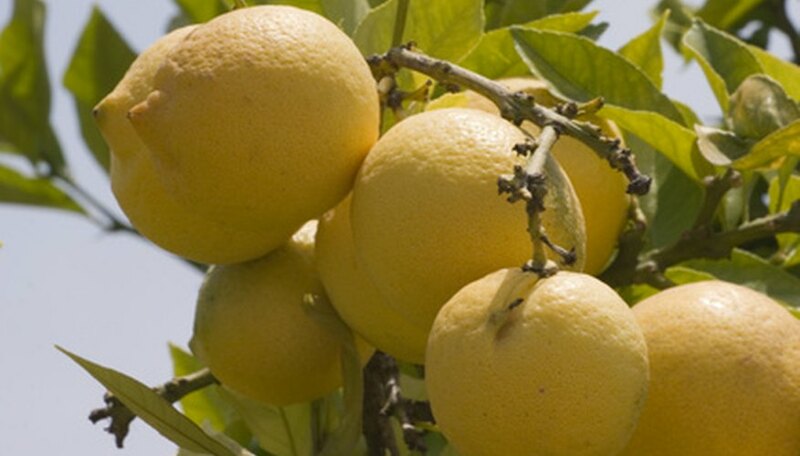 Gardeners and growers who live in cool areas, where winter temperatures drop under 20 degrees Fahrenheit, move citrus trees inside during the winter. There they can maintain temperatures at a level that protects the trees during their dormancy or keep the trees blooming and fruiting. In the winter, gardeners and growers use heaters, fans and organic heating methods to maintain temperatures over 40 degrees Fahrenheit for fruit trees. If the trees are still expected to produce fruit, a grower maintains temperatures of 70 to 80 degrees Fahrenheit and uses artificial lighting to maintain eight hours of sun exposure every day. Many gardeners grow their fruit trees in greenhouses year-round to counteract a region that doesn't support the trees on its own. In that case, it's important for the gardener to adjust their greenhouse conditions to the season, to take full advantage of any natural light and warmth. Greenhouse growing opens up new options for fruit trees but also has several drawbacks. Heating and cooling costs can be expensive, while heating the structure dries trees out more quickly than an outdoor environment. Greenhouse growing requires increased watering and misting to maintain the necessary moisture levels for all fruit trees. Is Tomato a Citrus Fruit?